Woocommerce Down Payment plugin is an excellent plugin that allows users to book products with pay partial payment. Admin can set deposit type fixed or percentage. 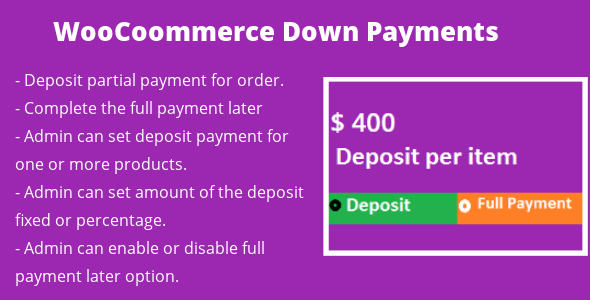 Woocommerce Down Payment plugin has the option to deposit partial payment of the product. User can pay with a deposit and complete the full payment later. Admin can set amount of the deposit fixed or percentage.